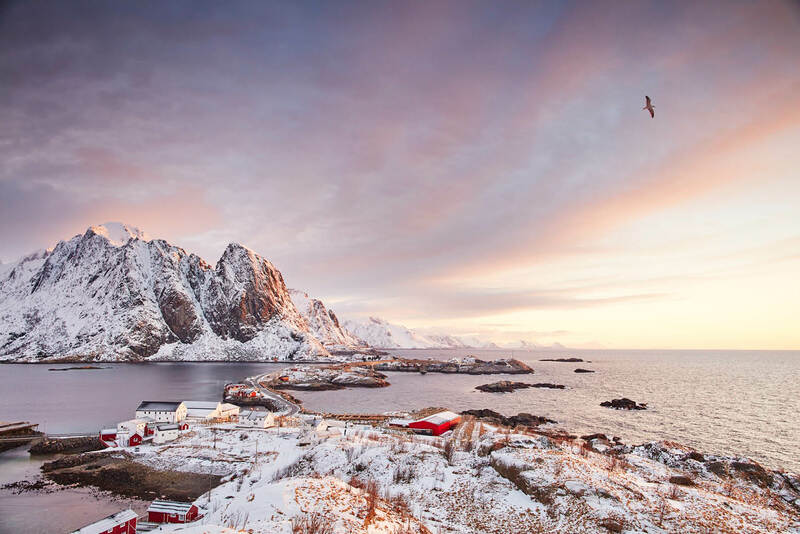 Sunrise in Sakrisoy, one of the Lofoten islands (photo: Ewen Bell). The Scandinavians bring a distinctive element of flare to their pursuit of the Northern Lights, laying a trail of exploration through the Arctic Circle that runs from Luleå to Lofoten. Fredrik Broman lives in Swedish Lapland, just below the Arctic Circle, on the edge of a frozen lake. His friends are scattered along the length of the lake and nearby rivers, easily accessed in winter by snowmobile or dog sleigh. On winter nights when the sky is clear, Fredrik and his friends keep an eye on the stars in anticipation of aurora activity. The Aurora Safari Camp, run by Fredrik, offers a uniquely Laplandic experience. Instead of a cosy cabin with thick timber walls and Scandinavian decor, Fredrik’s guests are offered canvas tents equipped with a very efficient wood stove and enough firewood to last through the night. It can be minus 35 degrees celsius outside, but it’s a toasty 20 degrees inside. The dining options include Arctic char that have been caught beneath the ice, before being grilled on an open fire, or reindeer meat slowly smoked in the sub-zero temperatures before it’s thinly sliced and cooked with pasta. Hot coffee and cinnamon buns are always on offer. The photogenic town of Reine (photo: Ewen Bell). Set among the tall trees, Fredrik’s camp looks upwards at the night sky and out across the lake. A floating sauna, trapped in the winter ice, marks the entrance to the camp when you arrive on the snowmobile trail. The sauna turns out to be a great place to watch the aurora when it kicks off. But knowing exactly when the Aurora Borealis is going to erupt into colour remains a minor mystery to science and a source of joy to the people of Swedish Lapland. There are dozens of apps that offer forecasts based on satellite measurements of solar activity, yet they cannot predict with any degree of precision where or when the sightings will happen. Ideally you need a cloudless night, some active solar winds and a thermos full of hot chocolate. Standing out on a frozen lake at 20 below zero demands good clothing and something to warm your fingers. A low-level event will show up on a long exposure if you have a tripod for your camera, but a big event reveals the green and purple hues to the naked eye. On such nights, they can even be seen above the glow of a full moon, ribbons of light erupting in the atmosphere miles above your head. Sometimes they rain down like a shower, sometimes they dance on the horizon like a ripple of incandescent curtains. Capturing aurora borealis above Uttakleiv Beach, Lofoten Islands (photo: Ewen Bell). You never know what will happen from one moment to the next, or if the show will suddenly come to an end leaving nothing but stars and darkness again. Even the nightly forecasts for auroras is not as useful as keeping an eye on twitter for real-time reports of solar activity. Aurora events can be seen anywhere from Iceland, to Arctic Norway to the Bay of Finland; there’s a highway in Scandinavia called the E10 that runs from the city of Luleå in Sweden all the way to the very tip of the Lofoten Islands in Norway, and every kilometre of that route offers potential sightings of the Northern Lights. Fredrik’s camp is just one way to immerse yourself in the chase. Get warm at Aurora Safari Camp (photo: Ewen Bell). Quirky but wonderful accommodation is a speciality of the Scandinavian Arctic. Heading west from the Aurora Safari Camp and entering the Arctic Circle, the highway passes the Treehotel and the original Ice Hotel, both of which offer richly artistic settings to spend the night and maybe catch a few auroras. The dedicated aurora chasers will keep heading west though until they reach a small national park called Abisko, and the clearest skies in all of Scandinavia. Abisko sits along the frozen Lake Torne, roughly 60 kilometres long and not far from the border with Norway. Here the E10 highway heads into the mountain ranges before descending down into the fjords and the islands of Lofoten. It’s the mountains that provide a weather shadow that gives Abisko its amazing clear skies throughout the winter. The Swedes chose this modest patch of wilderness to construct a Turiststation, an elaborate lodge that offers warm rooms and excellent food. For decades the Abisko National Park was quiet through the depths of winter, only coming to life as the ski season took off in early spring. But the Aurora Borealis now brings people from all over the world here in the very coldest and darkest months, when the sky is like pitch and the auroras can best be seen. As well as having great weather for aurora spotting, Abisko also boasts a dramatic chair lift that rises high above the landscape, with access offered to anyone who wants to brave 20 minutes dangling from a lift wearing a survival suit. Bed down at Treehotel (photo: Ewen Bell). The highway continues on from Abisko into the fjord of Narvik. Possibly one of the least attractive towns in all of Scandinavia, Narvik is, however, the gateway to some of the most beautiful scenery: Lofoten is a series of small islands connected by bridges and tunnels, and until modern times was famous for the cod fishing industry. Little red cabins dot the rocky shores, tiny timber enclaves to keep the Arctic weather out and trap the heat of a fire within. Fishing cabins were once the least desirable of all accommodation, fit only for the men who slept in them in bunks between trips to sea. But today they have been given modern comforts and a touch of Scandi-style, and are the most sought-after places to stay year round. 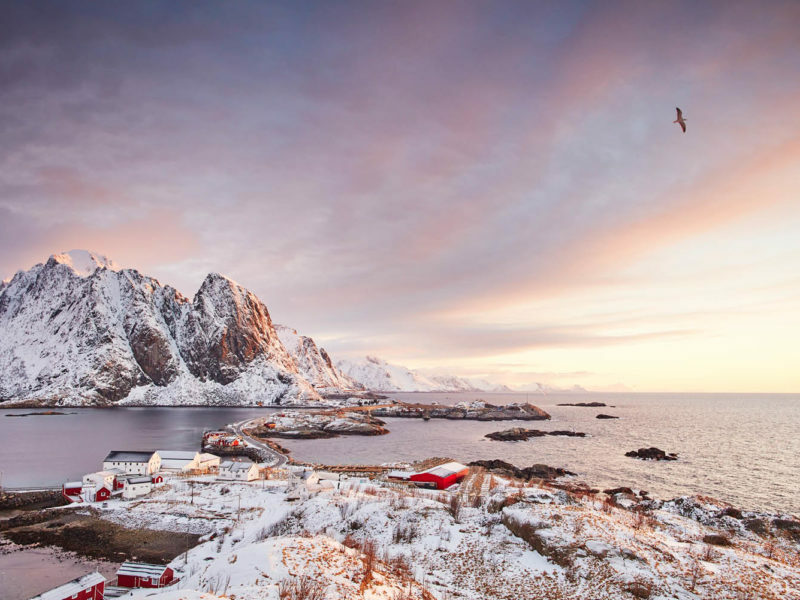 In towns like Reine, perhaps the most photographed town in Norway, the familiar red and white paint of the rorbuer adorn the dramatic scenery like rubies on a necklace. The fishermen still catch their cod in these treacherous waters, but most have moved to larger homes away from the cliff edges. Sit by the fire and escape the cold (photo: Ewen Bell). Lofoten draws waves of photographers during aurora season, when the nights are long and snowfall dusts the mountains; it’s not uncommon for fresh snow to cover the beaches here. On the right night the clear skies offer a view of one of the most elusive and wonderful light shows that Mother Nature has invented. Back in Swedish Lapland it’s possible that Fredrik is also watching the very same solar activity with a bunch of amateur photographers determined to capture the spectacle for posterity. It’s possible they all have a mug of hot chocolate in common, but from a different vantage point each will have a unique view of the Northern Lights as though it was their very own.